The Burmese star tortoise (Geochelone platynota), a medium-sized tortoise found only in Myanmar's central dry zone, has been brought back from the brink of extinction thanks to an aggressive captive-breeding effort spearheaded by a team of conservationists and government partners. Efforts to restore the tortoise are described in the latest issue of the peer-reviewed journal Herpetological Review. The tortoises now number over 14,000 individuals, up from an estimated population of just a few hundred animals in the early 2000s. Burgeoning demand from wildlife markets in southern China beginning in the mid-1990s virtually wiped out the tortoise in a matter of years until viable populations could no longer be found, and the species was considered ecologically extinct. In 2004, The Nature and Wildlife Conservation Division of the Myanmar Ministry of Natural Resources and Environmental Conservation in collaboration with the Wildlife Conservation Society (WCS)/Turtle Survival Alliance (TSA) Myanmar Program established three "assurance colonies" to hedge against the extinction of wild populations. The three colonies began with an estimated 175 individuals, mostly confiscated from illegal wildlife traffickers. The colonies were sited at facilities within existing wildlife sanctuaries. After the colonies were established, conservationists had to determine the species' husbandry requirements including diet, feeding, reproduction, and hatchling care. Herpetologists from WCS's Bronx Zoo helped design the breeding centers as well as provide husbandry expertise. In addition, veterinarians and molecular scientists from the Bronx Zoo conducted health screenings of the captive population to determine what diseases might be present (no major diseases of concern were discovered). Bronx Zoo vets continue to consult with WCS Myanmar vets on various health cases, confirming diagnoses and recommending treatment options. Approximately 750 animals have been released into wild areas of the sanctuaries, and the long term objective of restoring viable populations in every protected area in the central dry zone is now biologically attainable. However, political and social challenges need to be resolved before large-scale reintroduction takes place to ensure the tortoises are not taken by poachers. Said lead author Steven Platt, a herpetologist with WCS's Myanmar Program: "This is the modern day equivalent of saving the bison from extinction. A team of conservationists spearheaded an aggressive captive breeding effort, and have brought an animal back from the brink to where it now has the potential to be reintroduced into the wild in large numbers." 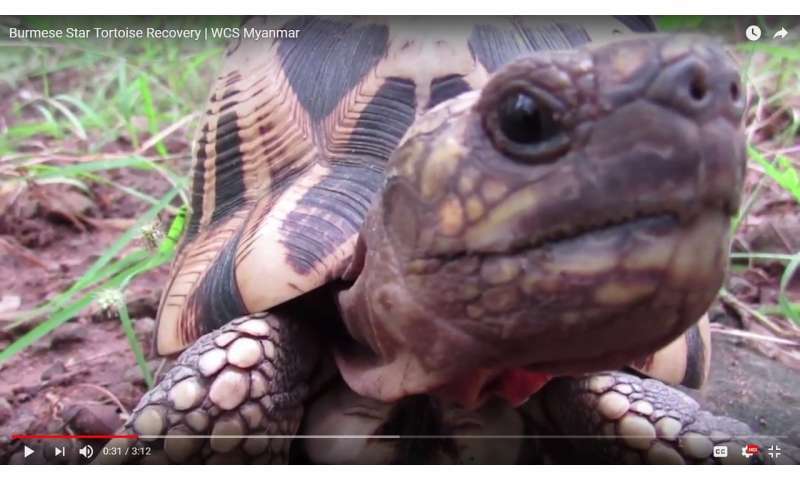 Said Andrew Walde, Chief Operating Officer of Turtle Survival Alliance: "The Myanmar WCS/TSA partnership is a model chelonian conservation success story. If you had told me more than 10 years ago when the project started that we would have more than 10,000 Burmese Star tortoises, and that we would have returned nearly a thousand to the wild, I wouldn't have believed it. It is success stories like this that make all the hard work worth it." WCS works to save turtles and tortoises around the world. In 2012, WCS launched an organization-wide program to revive some of the most endangered turtle and tortoise species. Efforts include breeding programs at the Bronx Zoo in New York, head-start programs abroad, and working with governments and communities to save species on the brink of extinction. WCS tortoise conservation in Myanmar is supported by The Leona M. and Harry B. Helmsley Charitable Trust, the Andrew Sabin Family Foundation, the Panaphil and Uphill Foundations, and the Turtle Conservation Fund.